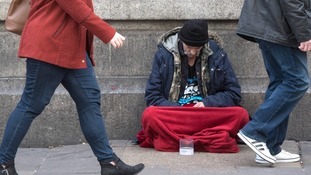 The House of Lords has been told it would help homeless people as fewer people carry cash. Forced to sleep in temperatures as cold as -15.4C, rough sleepers are among the worst affected by the cold weather that has hit the UK. According to homeless charity Crisis, rough sleepers are 17 times more likely to experience horrifying abuse than the general public. Life expectancy for the homeless is nearly half that for people in stable housing. The festive period is a time for giving, so what can we do for homeless people to make Christmas time more bearable? Martha Culley from Northampton was so moved by the plight of one rough sleeper, she decided to do something about it herself. Hull’s Raise the Roof charity says it has had no explanation why the Royal Hotel cancelled its booking. Artists have carved a 3.5 metre tall ice Christmas tree in Manchester inviting the public to donate gifts to homeless people. The competition gives participants hope and the opportunity to shape a new life for themselves.